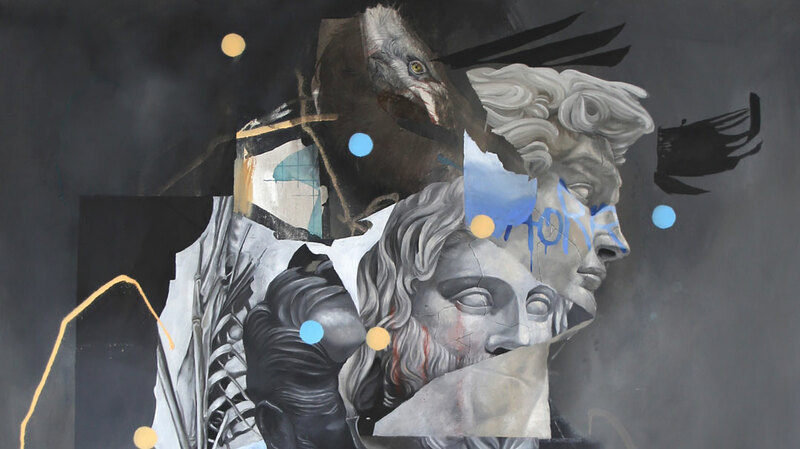 Kicking off 2019 with his first release, Dutch artist Joram Roukes returns with Renaissance Party. 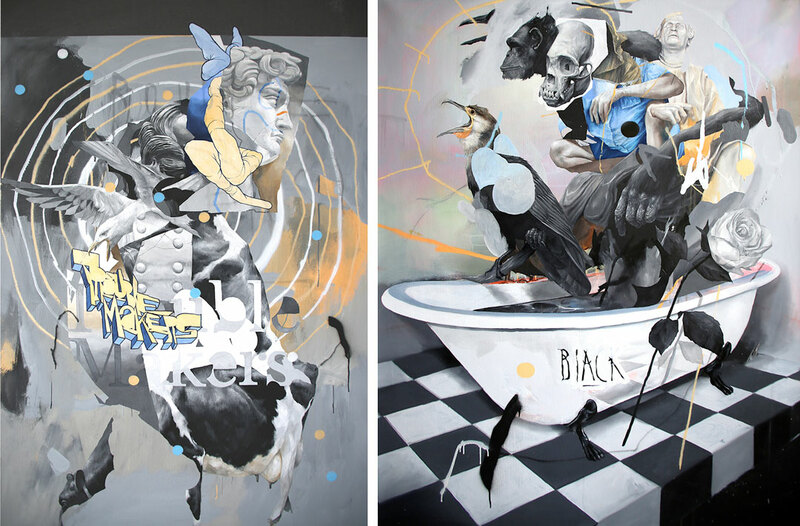 Pulled from Rouke’s most recent solo exhibition, Renaissance Party is available in Standard + Hand-Embellished editions. Playing on classical marble and bronze busts, Roukes simultaneously pays homage to the work being constructed by the current generation of painters and artists. 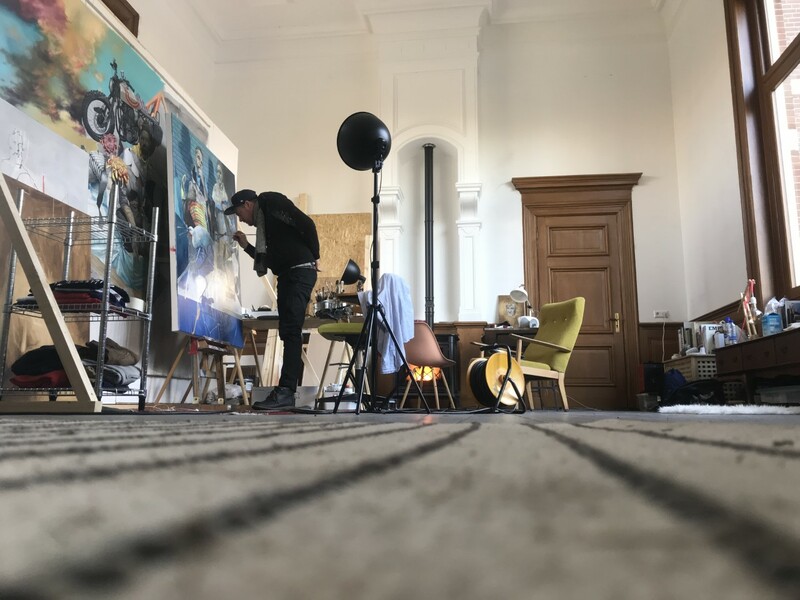 Read on as Joram Roukes takes us through Renaissance Party, shows off his recent murals and more. 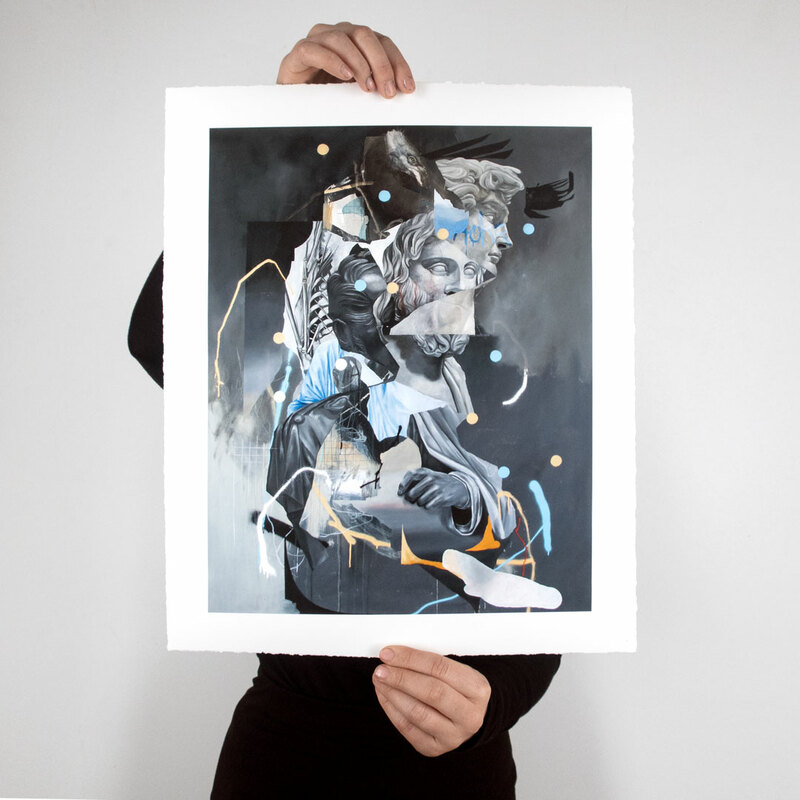 . .
1xRUN: Tell us a little bit about this piece, anything immediate you would like us to highlight about this image? 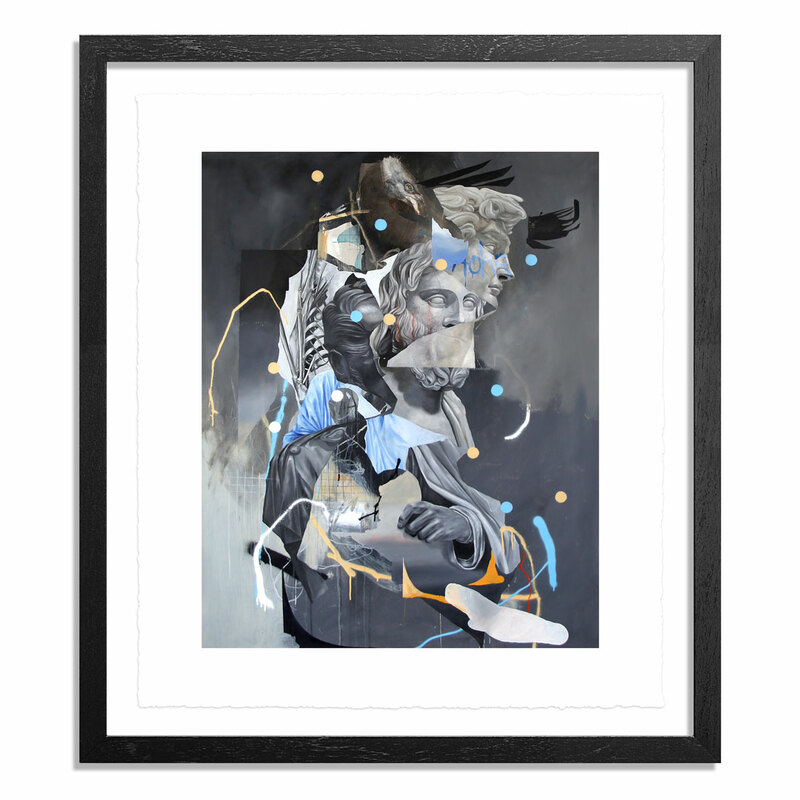 Joram Roukes: This painting is among my favorite pieces where I explored classical references as collages. 1x: Was this image part of a recent theme, series or show that you had? If so how did it fit into that given grouping? 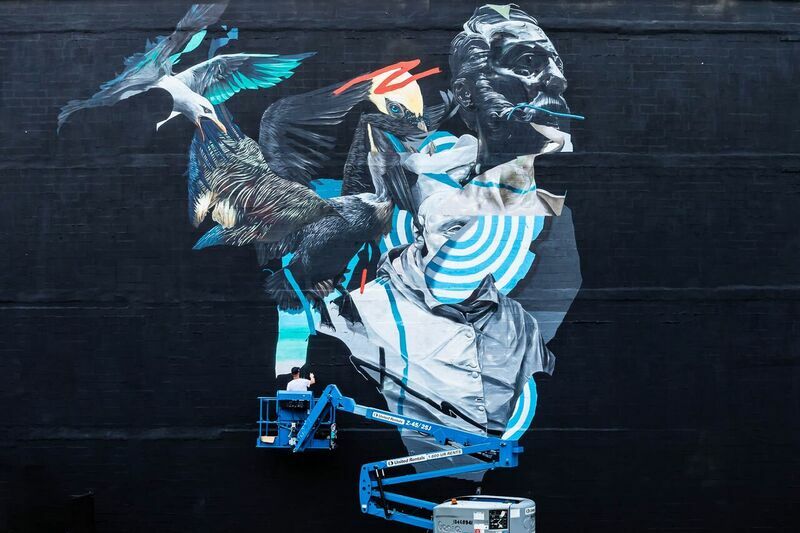 Roukes: The piece was part of my recent ‘Troublemakers’ solo show and residency with Hellion Gallery in Portland. The works in this show were all built around and on references of classical marble and bronze busts. It’s a nod to how a new art historical frame of reference is being constructed by a current generation of painters and artists. 1x: When was this piece originally drawn and created? What materials were used? Roukes: It was done in oil paint with a dash of spray paint, probably around March or April of 2018. 1x: Tell us how the idea and execution came about for this image? Roukes: The general idea on art history as described above, I’ve had for some time. The specific execution is a result of endlessly collaging and arranging reference imagery to find the right composition and substance. 1x: How long did each of this image take to create from start to finish? Roukes: This painting took me about a week. Maybe two if you include initial collages and preparation. It’s always a bit hard to tell as there’s many facets to the process. 1x: What is unique about this piece compared with your other work? Roukes: It’s centered around classicism and has a recognizable anatomical element to it, as opposed to many other works that have a more animalistic and lucid nature. This painting is therefore much more formal. Yet it still likes to party. That was a Talladega Nights reference. 1x: Why should people buy this one of these prints? Roukes: Because this is a very strong image. Because the original sold very fast. Because the execution of the print is incredible. The paper is lush and rugged. I think this one just makes total sense. 1x: Describe this image in one gut reaction word. Roukes: I think our last release must have been during Pow!Wow! In 2016. So a bunch has happened! Work-wise I have done a few really great shows. A solo show with a residency in Paris and Portland. I have stepped up my mural game since. Did projects in Atlanta, Denmark, Vegas, Florida. I recently got a new studio in an old funeral home next to a cemetery. So I’m definitely interested to see how the ghouls will affect my process. I moved in with my talented girlfriend. So overall things are just pretty great! 1x: What are some of the ways you have been trying to push yourself with your work over the last year? Roukes: Definitely by trying to do more large murals. It was a total challenge the first time I tried to magnify my work on that scale, and it still is every time. But it’s a rewarding process. 1x: What are some strides you feel you’ve made in your work recently? Roukes: I think I have advanced technically recently. I feel more patient when I paint and it pays off. 1x: What was the last piece of art that you bought? Roukes: I commissioned my good friend Roelant to make a large version of a small Lebron James drawing he did. I built a custom frame for it and it looks incredible. 1x: Do you have any big shows or events coming up that you’d like to share? Roukes: Yes! A big show is coming with KIRK Gallery in Denmark in April, together with TelmoMiel. Also planning to curate a show in Paris for Galerie 42b. So that will be exciting. A couple more tentative things that will pan out in the next weeks so just stay tuned! 1xRUN: Where else can people find you?